How do you get your dog to stop? Do you have a problem with your dog chasing cars? 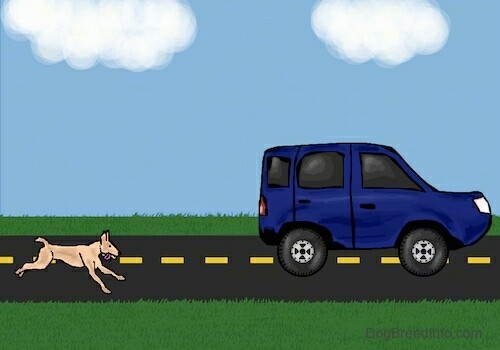 If your dog continues to chase cars there is a very good chance he will soon get hit by one. This is a serious problem that needs to be addressed. It is best to try to avoid this nasty habit in the first place by not encouraging him to chase. If your dog steals something from you do not chase after him, call him to you with the "come" command and when he comes to you reward him. This basic obedience training will do wonders for your dog. Teach your dog to only chase what he can bring back to you. Just about all dogs like to chase; it is in their nature. From chasing game to trial criminal chasing, to a dog a car is no different than a huge rabbit. Prevention is the best policy, BUT if your dog is already a chaser, how can you stop him? Putting in an underground electric or above-ground fence is your best bet. But if this is not possible or you would like to have your dog out with you outside the fence, you can try using a shock collar with a hand-held control. When the dog chases after a car you shock him. Do not say he word "no" when you shock him. You want him to associate the car with the shock and not the word "no" with the shock or the dog will do it as soon as you are out of sight. Some people may think it is cruel to use a shock collar, but it is worse for the dog to get hit and run over by a car. Nothing is better than a fenced yard. But, in a rural setting with a lot of open land this is a good alternative. It is the same idea as using an electric underground fence. These fences work by putting a wire underground that you cannot see. If the dog starts to wander off the property, or the boundary you set for him, the special collar the dog is wearing shocks him. The dog soon learns his boundaries avoiding the shock, and he will soon learn not to chase cars as well. Use the collar as a training session. It is an effective method for stopping a dangerous habit. Another method to try is to have a friend drive by in their car slowly. When your dog chases the car have your friend throw water balloons at the dog, not to hurt him, but to scare him into not wanting to chase cars anymore. I am not sure how effective this method is since your dog may learn that only your friend's car is scary to chase. If you can get your dog obedience trained well enough you can train him to stop on command, but if you are not paying attention when the car drives by you may be too late in stopping your dog. Doing special car chasing training is wise if your dog is a car chaser.